Was Paris attack ringleader in Leros? Jump to media player Two independent eyewitnesses tell the BBC they saw the ringleader of the Paris attacks on the Greek island of Leros, in October, placing him on the island at the same time the two Stade de France suicide bombers arrived. Paris attacker's escape from Athens Jump to media player The BBC has learnt that the ringleader of the Paris attacks was being tracked by police 10 months earlier, but got away. UK links to Paris attacks investigated Jump to media player Anti-terror police investigate possible British links to the extremists behind November's attacks in Paris. Paris 'ringleader' evidence emerges Jump to media player The suspected ringleader of the Paris attacks was near the Bataclan theatre during a siege there, prosecutors have said. Stade de France bomber named Jump to media player The picture of a suicide bomber issued by French police in connection with the Paris attacks is of a man travelling under the name of M al-Mahmod. Security questions raised by Paris attacks Jump to media player The discovery of Abdelhamid Abaaoud in Paris raises questions about how a man wanted for other attacks in Europe managed to stay undetected. 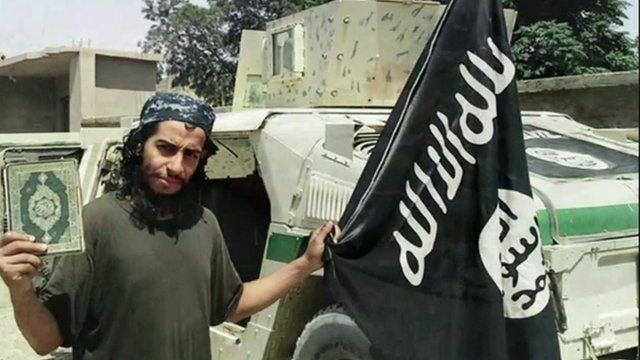 Was Paris attack ringleader Abdelhamid Abaaoud in Leros? Two independent eyewitnesses have told the BBC that they saw the ringleader of the Paris attacks on the Greek island of Leros in October, placing him on the island at the same time the two Stade de France suicide bombers arrived. The sightings of Abdelhamid Abaaoud appear to back up reports in French newspapers on Monday, which quoted Morrocan and French security officials saying it was highly likely that he was on the island in late September and early October. Gavin Lee reports from Leros.